Night kayaking with Tanaz is a unique and overwhelming experience and a major attraction of Havelock Island. You get to the Havelock dock and meet the beautiful and elegant, Tanaz. You don’t need to know kayaking to enjoy this attraction. Tanaz gives a brief training on the basics of kayaking and very soon you would be good to go. There are usually bunches of seven to eight curious tourists who do the trip together. 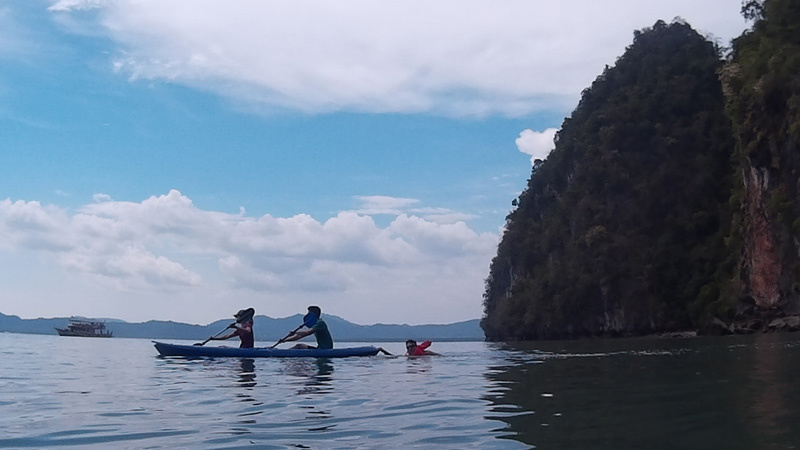 After hauling the heavy paddles and the kayaks down the rough path to the quiet and mysterious waters among the mangroves, you get set go paddling through the dark waters. The all-pervading silence awes you. The sudden occasional splash of the sea creatures somewhere close to you startles you. Tanaz explains of the mystery of the iridescence of the sea waters. The biological explanation does not spoil the beauty of the million fire flies lighting up the water with each stroke of your paddle. After you settle down and start enjoying the sparkling waters, Tanaz goes on to unfold the whole mystery of the stars that twinkle above you. She narrates the enigmatic stories associated with each stars and familiarizes you with the innumerable constellations. She goes on to show you how to find directions through star gazing and how to identify the planets and the pole star.